Some questions from the Outdoor Blogger Network in their writing prompt...The prompt this week is, "Why do you blog"?? Simple!! Because I don't want to write in a journal...typing 80 wpm is much easier!!! HAHA. "What got you started with that first blog entry?" Rather, Who...not What! Rebecca Garlock, "The Outdooress"...yep, we can blame her...or give her credit...whichever you choose. "Are the reasons you started blogging the same now as when you started?" No Way! Now How! I started the blog thinking that I could post up once a week and it wouldn't take too much time. Haha...I kind of got a "blogger's addiction" and I'm now posting three or more times a week! Not that it is a bad thing...I am immensely enjoying every minute of it. "Has blogging changed anything for you?" Definitely!! My little fly fishing world has now evolved into a "sharing time" rather than me and my kind of secret passion no one knew about. And it's actually more fun that way! What keeps me blogging? YOU!! Bottom line. Through outdoor blogging, I have met such wonderful, funny people that give back so much...more than what I probably give out there. So, for that...THANK YOU!!! This has to be one of the craziest hobbies if that is what you call it. You know, it is something more though...it is a forum for expression. And that is why I do it. You understand about this passion for fly fishing, where others around me don't as much... 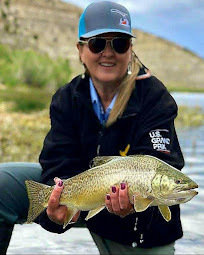 I can connect with those other outdoor enthusiasts that share the passion of the outdoors and understand why I spend so much time with nature and varmints like big brown trout, bears, mice, bison, snakes, etc. 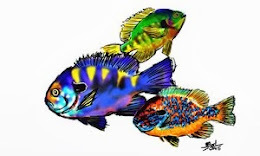 etc...And on the flip side...I have enjoyed other talented bloggers share their newly made flies to reading about different areas of the world to go visit and fish someday! 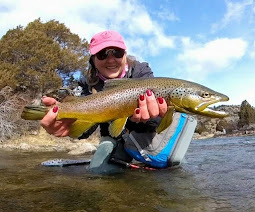 So, I thank the OBN for getting me involved and hopefully I can continue to give a smile here and there from my ramblings of everyday craziness to my passion of fly fishing! Well little lady (he said in his best John Wayne voice)you've certainly grown up. Sometimes you run into a unique little place that makes you want to hang out for awhile. This is one of them. It's always a pleasure to read your work- keep it up. Dustin ~ Thanks and it has been great reading over on your side as well! Duke ~ I just try to keep up with the other "pilgrims"!! Mark ~ I'm glad that we've found that hat rack...I'ts been fun! I'm a fan of your blog for sure! Thanks to Rebecca for giving you the nudge. Totally with you on keeping a journal. Bought an on-stream journal, but was too busy fishing to write in it! Wonder if one of those chest packs with a fold-down front pocket might offer a platform for a tablet computer? Thanks for the fun words. OWL ~ Oh my goodness! That's a lot for a girl to live up to!!! Thank you, my friend. What I enjoy about your blog, and most bloggers, is you get first hand experiences, opinions, and unpaid for common sense thoughts. I agree with you in so many ways! 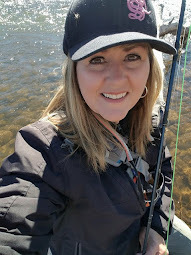 It is fun to enjoy the solitude of a thing but sharing that passion with others just as excited about fishing can be apst addictively intoxicating:) thanks for sharing! Brt Trt ~ Well, you would have to wonder about my common sense sometimes!! Lol. I thank you for your comment. Blogger's addiction - I hear 'ya! I'm only a couple months into my blog and I'm spending every spare minute on it. Do we need to start a support group? Nah, that would just take up valuable blogging time. Keep up the great postings! PDX ~ Ya know, I haven't found a solution yet. But, thanks for joining me in the "blogger enthusiasts" group!